This past weekend, I was cleaning out the freezer and found some home made bratwurst (using this recipe) hiding in the back. This package of brats was in bulk form (ie wasn’t stuffed into casings) and I thought it would be perfect to make some burgers. Now, if you don’t happen to have fresh, home made bratwurst in your freezer (I do feel sorry for you), then you can always grab some links from your grocery store, slice open the casings and form them into your own burgers. 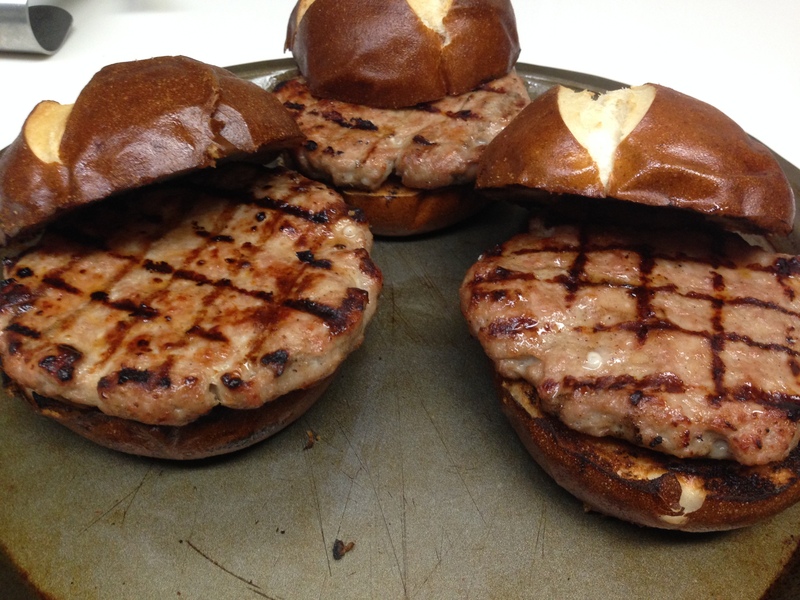 I happened to have a pound of bratwurst which was perfect to make 3 patties as I like my burgers around 1/3 lb each. Feel free to make your patties to whatever size makes you happy. I set up my Egg for a direct cook around 500F. The bratwurst burgers were grilled for about 2 minutes, then turned 90 degrees, grilled another 2 minutes, then flipped and repeated on the other side. Grill until the temp reaches 160F (carryover will take it to 165F). Even though the FDA says pork is safe at 145F, with ground pork (ie sausage), I like to play it on the safe side, especially if I didn’t grind it myself and it’s store bought. I know pretzel buns are probably “so last year”, but while at the store getting some other things, I spotted them at my bakery for the first time. I’m not always the first to jump on every food bandwagon. Often times, I just watch it pass by and shake my head. 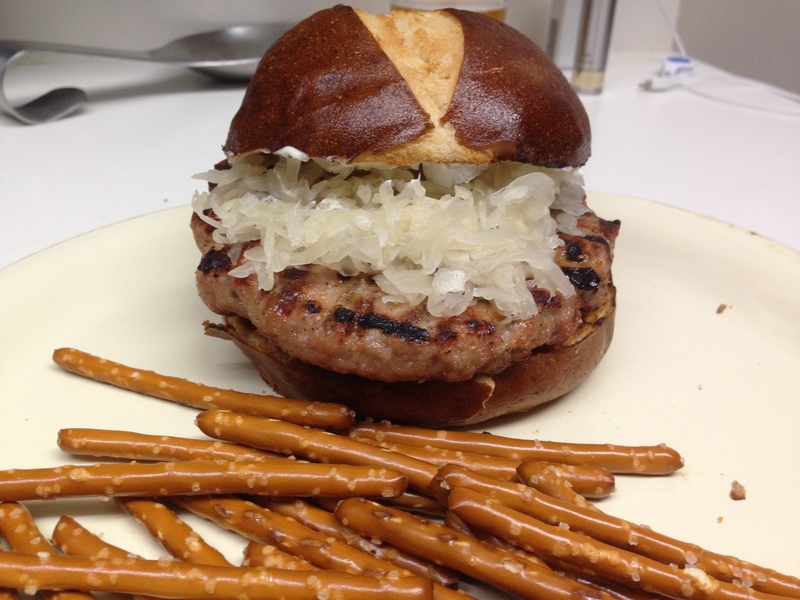 Some of them make no sense to me, but pretzel buns with bratwurst burgers? Seemed like they were made for each other. Made me take a short trip down memory lane. Sitting at a biergarten in Germany. Drinking beer and snacking on pretzels and sausages. Good times. Sorry. My minds started to wander there for a bit. 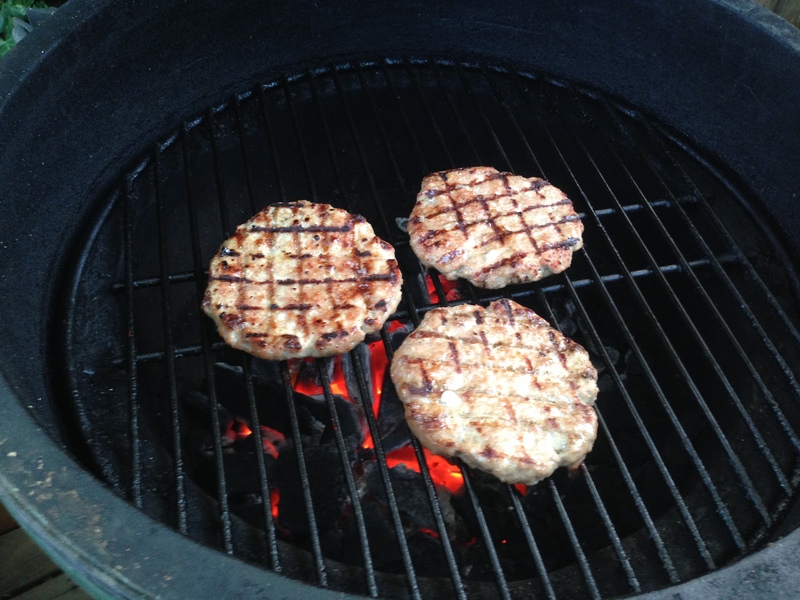 So how to top these bratwurst burgers? I decided to keep it simple. Some spicy, brown mustard and a bit of sauerkraut. And why not some more pretzels on the side and a cold beer to wash it down (not pictured)? Taking a food that is normally eaten as a link and serving it in a burger form was different, to say the least. I mean I knew on a mental level what to expect it to taste like, but picking it up, it was like some kind of mental muscle memory kicked in and I almost expected it to taste like a burger. Like the eyes and sense of taste and mind just weren’t meshing up. It’s hard to explain. I think I had the same experience when we made King Ranch Mac and Cheese. I expected that to taste like Mac and Cheese, but then got all the flavors of King Ranch Chicken. Weird what the brain can do to you sometimes. Regardless, it was a pretty tasty burger/bratwurst burger. The only thing I think it was missing was some kind of cheese. What kind of cheese would you serve on a bratwurst burger? I understand that sort of a brain thing completely — which is why you’ll never see a barbecue pizza come from oven (or any pizza with chicken on it). But the brat burger? I don’t think my brain would kick out the same reaction. Looks outstanding, man. I could see myself using some stone ground mustard on that (with the pretzel bun and all) or would even consider Thousand Island (or my homemade Spicy Southwest-style Louis Dressing). As for the cheese — smoked Provolone all the way. Yeah, I’m not really a big fan of BBQ pizzas (although I do enjoy a chicken pizza with a nice white sauce). I did start thinking of Thousand Island dressing. Maybe some swiss cheese, but then I started thinking that was getting into the Reuben Sandwich kind of realm. Plus, I didn’t have any and didn’t feel like going to the store. The options available to me in my fridge were cheddar, shredded Mexican blend, American (for those days when you crave a classic grilled cheese or need to get medicine down a dog’s throat), feta or Velveeta. None of which sounded appealing. Pretzel buns are the best ever!!!!!! They worked pretty good with the brat patty. Yeah I had one at red robin with fish.. Amazing ! Sounds delicious! I’d top it with a mix of shredded sharp cheddar and Gruyere, smoked if possible. That could definitely have worked. Might try that next time. Damn!! You are right. I’ve even made cheddarwurst before. FacePalm!! I’d go for some Swiss or provolone and caramelized onions are a must! What a great grilling idea! I’m going to have to put that one on the list to make. A smoky gruyere would be divine. I think you are right. A smoky gruyere would be perfect. Will try that next time. Thanks for stopping by. Wish there was one extra for me!!! Maybe next time. Thanks for stopping by. 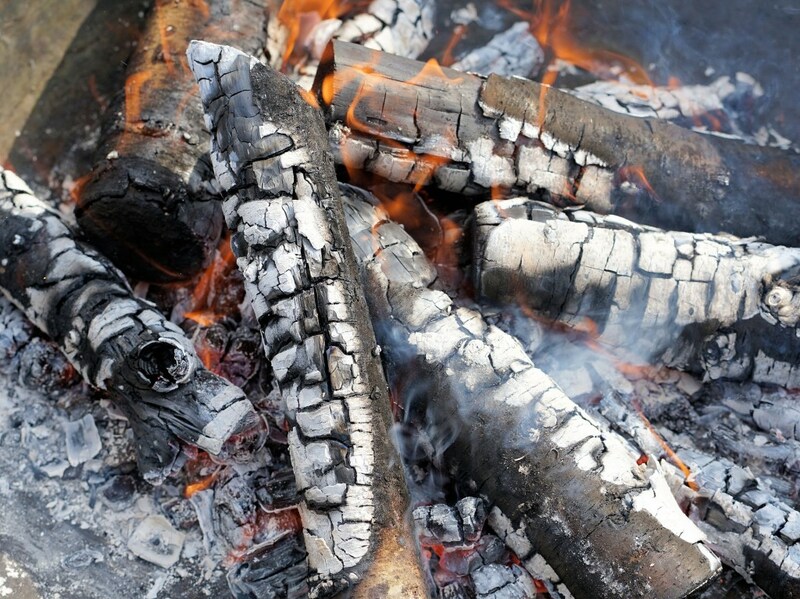 I love Bratburgers! The pretzel bun was a nice addition! Thanks. A first for me. I’ve heard of them and even seen the Johnsonville versions in the store, just had never tried them. I’ve had a few brat burgers and found that I really enjoy the flavor. If you use a brat burger and a beef burger in a twin stack, you’ll have an Oostburger of sorts. That’s what they call a burger topped with brats up in Sheboygan brat country. Dang!! I’ve never heard of an Oostburger. Now I want one. What else do they put on one of those topping wise? Any chance you would give up your recipe for the brat patty? I made some and thought they could use some more flavor. Wondering how you flavored yours? Never mind, I found the link sorry about that.